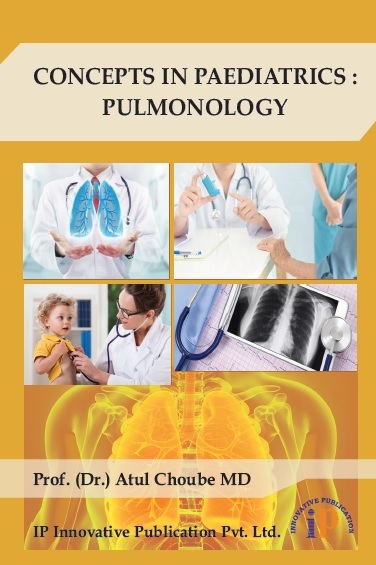 The goal of the "CONCEPTS IN PAEDIATRICS : PULMONOLOGY" is to inform medical students, residents and physicians the principles of diagnosis and therapy of pulmonary diseases. The target audience are all practicing paediatricians, physicians and health care professionals who provide patient care to population. Upon reading of this book the readers will be able to learn pulmonary paediatrics including pathophysiology, clinical manifestations, evaluation and management of diseases of lungs. The book enables the learners to recognize symptoms and signs of respiratory diseases including respiratory failure, respiratory infections and congenital and acquired lung problems. Prof. (Dr.) Atul Choube MD, is an alumnus of Armed Forces Medical College. He has vast experience in teaching undergraduate and postgraduate Paediatrics and is an examiner in many medical colleges. He has written research articles in National and International journals and authored books on many medical subjects. Currently, he is Professor and Head of the Department of Paediatrics in Rajshree Medical Research Institute and Medical College, Bareilly, India.